Who better to pay tribute to the fabulous Monks and maintain their outrageous avant-garde garage-rock sound than the sisterhood of seven London garage-dames called Ye Nuns? The Monks' lasting influence was in convincing people that you could try anything (a banjo in a garage band? ), as long as you did it with attitude, and the essential beat of your songs struck a primeval chord with the listener. The Monks’ imprint on music grows stronger even as the original band dies off and Ye Nuns transubstantiate that sound better than the Fall, better than the White Stripes, better than anyone else. Ye Nuns have been getting what the Monks did for years, applying the lessons in live shows, dressed in wimples and habits and looking like a set of evil Julie Andrews. Their music has the Monks’ primitivism but also their sense of rebellious abandon, all of this delivered on their magnificent platter of blasphemous garage rock. From aggressive opener ‘Higgle-dy Piggle-dy’, with its cracked guitar solo and mad banjo assault, to the closing ‘Shut Up’, all shrill organ and a bassline that feels like someone stomping on your kidneys, this is a frenzied fuzzbeat treat from end to end. ‘Drunken Maria’ has a crazy, tottering rhythm, ‘Wie Du’ is thunderous garage-punk but with heavenly harmonies, and ‘Love Came Tumblin’ Down’ is twangtastic garage rock. It all sounds fantastic because the songs – recorded in two days at Gizzard Studios – are being played by people who did time in The A Lines, Echobelly, Thee Headcoatees, to name a handful, so that lo-fi garage sound is perfect. There’s a sense of humour at play too, in Sister Lolo’s Americanised intros for ‘Nun Time’ and ‘Cuckoo’’s madcap nursery rhyme rhythms. You should already know the songs; the Nuns bless them with a fiery passion and electric mayhem, and even an anarchic riot grrrl sassiness. 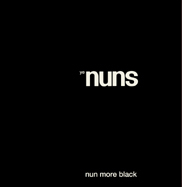 They’re not real nuns, but this record is an honest-to-god miracle.